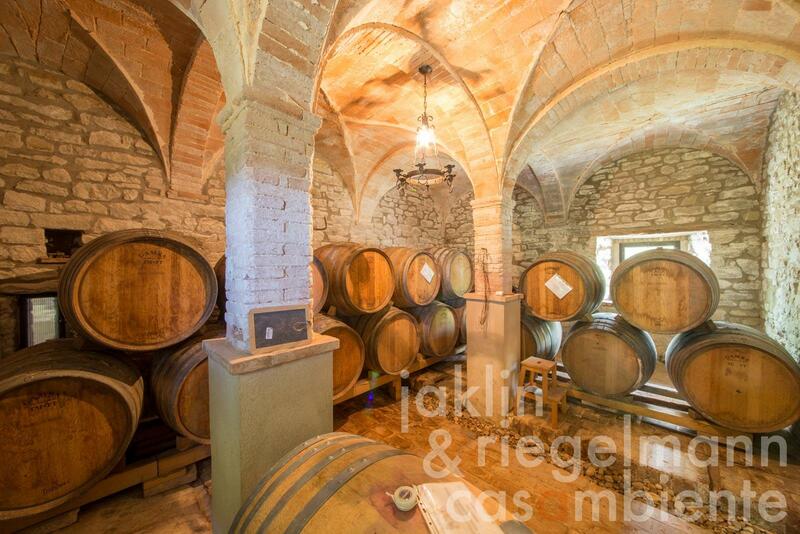 The wine producer for sale is situated in Emilia Romagna near the border with Tuscany. Facing south and overlooking the pleasant scenery of the Apennine hills, the building complex includes approximately 13 hectares (ha) of land overall; there is a very well maintained vineyard of about 1.82 ha, and a building complex made up of a residential building and a cellar. Both the garden and the vineyard are fully fenced. The winery is run by a family of winemakers having extensive experience, who are willing to assist the new owners in the transition process of managing the business. The winery's products have reaped excellent results in the trade press of the wine sector (eg. Decanter, Gambero Rosso). The building was refurbished in 2012 and is on two levels. The ground floor features a hall with oven, study, dining room, kitchen and washroom facilities. The upper floor comprises a living room and 3 bedrooms, each with a mezzanine, as well as two bathrooms. The modern cellar, of about 135 m², is a recent construction dating from 2013, and is fully equipped with wine cisterns, a store for oak barrels, and a warehouse area for bottles. The variety grown is Sangiovese, which was planted in 2005 with the spurred cordon technique with distances of 0.7 x 2.30 m, and a density of 6,500 vines per hectare. The amount of grapes produced annually is about 22,600 kg. The annual production is approx. 18,000 bottles of red wine and about 1,500 bottles of white wine, which can be increased by leasing additional vineyards and/or by purchasing additional grapes and/or wine. The wines produced are Romagna DOC Sangiovese Superiore, Romagna DOC Sangiovese Riserva and Ravenna Chardonnay IGT (through purchase of white grapes). The wines are marketed in Italy, Switzerland, USA, Germany, Australia, UK and Canada. The cellar's current capacity is 39,600 litres. Production of olive oil from about 40 trees. The sale proposal does not include the wine stock. Electricity, mains water, central heating, fireplace, gas tank, telephone, broadband internet access, satellite-TV, automatic gate, private parking, terrace, vineyard, olive grove, garden.